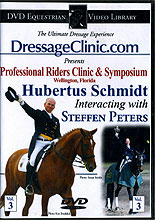 Hubertus Schmidt is known throughout the world as the Professionals' Professional because so many of the world's leading dressage competitors seek him out for training assistance. A member of the 2004 Gold medal winning German Olympic Team, Schmidt grew up on the family farm near Paderborn, Germany. His father converted the farm into a riding center in the 1970's and Schmidt started riding in 1976. Only two years later, in 1978, he passed the German Bereiter exam and rode his first Grand Prix in 1987. In the two decades since then he has developed more than a dozen Grand Prix horses. Along the way, he has gained an international reputation for his training success. Throughout his education as a rider and trainer, Schmidtt has worked with many of the 20th Century's masters, among them Harry Boldt, Reiner Klimke and Johann Hinneman. By the late 1990's, he had become one of Germany's top dressage riders and won the German Professional Championships four years in a row, from 1997 to 2000. In 2003, aboard Wansuela Suerte, he won the "B" Grand Prix Freestyle at the prestigious Aachen horse show in Aachen, Germany. The next year, he and the mare competed in the 2004 Athens Olympics and earned a Team Gold Medal. As a result of his skill as a trainer, Schmidt has become a highly sought after instructor throughout the world. When not on the road teaching clinics, he is busy at home training horses and instructing the many FEI level riders who flock to his barn from around the world.